Every day we put in immense amounts of hard work and double shifts to earn our money. It is absolutely out of the question to trust our valuables in less than capable hands. The Winchester Ranger Deluxe 31-11-E Gun Safe is a incredibly sturdy gun safe. Winchester being one the most trusted hunting brands on the planet makes it an easy buy. It is inevitable that you get what you pay for when it comes to hunting gear. This gun safe is no different. The thick Granite on the outside of the Winchester Ranger Deluxe 31-11-E is state of the art. When it comes to high heat flames touching the safe during a house fire; it can withstand 1400 degrees Fahrenheit for one hour. The new fireproof technology is why this gun safe has been very sought after as of late. Your guns and other hunting gear will be well protected under the 3 layers of fireboard in the door, and 2 layers of fireboard which encompasses the inside of the whole body. The external door hinge allows full fireboard protection. A lot of time for gun safes there is a weak spot. Winchester went ahead and patched up this loophole in the safe’s security system with the external door hinge mechanism. The door hinges also allow a full 180 degree door swing. The fire resisting ability of the safe makes the high price tag worth it. Spend around $1,500 on this safe to protect your $10,000 worth of fire arms. The total 31.3 Cubic feet of space on the inside of the safe ensures that you will be able to fit everything inside. We were able to fit all of our firearms here at TossTheKey. Customers on Amazon also reported being able to fit all their hunting gear in there safe as well. These anti burglary features couple with the gun safe’s 745 pound weight make it way too difficult for any burglar to get into. All of these features make the safe worth the high price tag alone. There is no need to worry about misplacing the key either. The electronic lock will have you covered. The price is obviously quite steep, but as stated above, you need to sink good money to ensure your thousands in firearms and other equipment stay secure. If your safe is damaged in a fire or a robbery, the replacement guarantee that comes with Winchester products ensures you receive a replacement. Make sure after purchasing the safe you keep spare batteries on hand at all times. This will ensure that you don’t run into any problems with the electronic locking system. 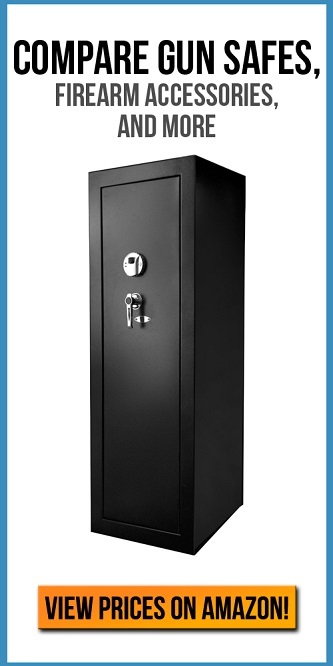 The Ranger Deluxe 31-11-E safe is a very nice looking piece of equipment. There is no worry of it sticking out like a sore thumb if that is a concern to you. The spacious interior and overall excellent Winchester grade construction ensures that no fire, water or burglar is getting at your guns. The security system is great and unlike some customers on Amazon – we had a very easy time installing the bolts which lock it down to the ground. The safe gets a 9/10 from us here at TossTheKey. A great buy for anyone serious about keeping their valuables safe.